The winner is commenter #4, Congratulations Missy! I’ve been working with Mary Ann from MimicDesign’s Etsy shop. Her shop has some seriously beautiful clutches with any type of animal print you can imagine accompanied by leather embroidered bags. I’ve accessorized with her clutches in several previous posts: here, here, here & here. Ya I know, I’m kind of obsessed. Here’s how you can enter to win! 1. Like MimicDesign’s Facebook page –> here 2. 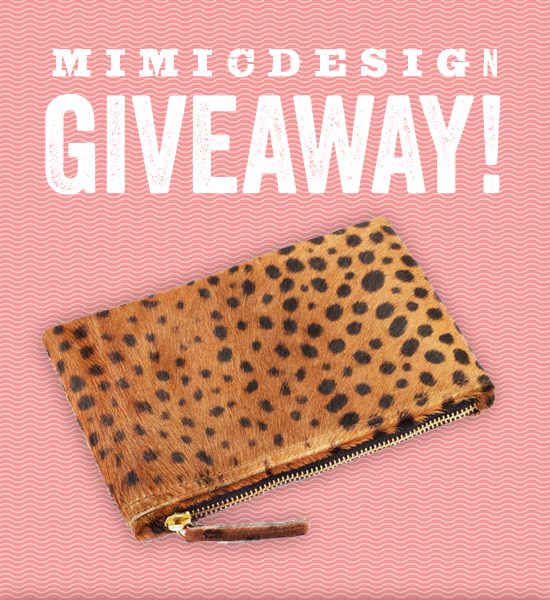 Respond to the question posted on her Facebook page: What is your favorite product within the MimicDesign shop? Cut off time will be Thursday evening before midnight! The winner selected at random and will be announced at noon on Friday 4/4/2014. Clutch ships only to USA & Canada. Done! Love her things! Thanks. My favorite product is the Special Edition-Asymmetrical Leopard fold over clutch. Love how it’s still a classic but has a fun twist to it with the design! Can spice up any outfit! Entered! I’m loving that monogram fold over clutch or any of the animal print bags. I have a weak spot for everything that is personalised! We’ll announce on both. Check the blog first!